"Karkur" redirects here. For the village in northern Syria, see Qarqur. Pardes Hanna-Karkur (Hebrew: פַּרְדֵּס חַנָּה-כַּרְכּוּר, Arabic: برديس حنه كركور‎) is a town in the Haifa District of Israel. In 2017 it had a population of 41,142. 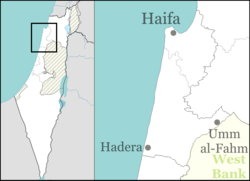 In 1913, 15 square kilometers of land was purchased by the Hachsharat Hayishuv society from Arabs in Jenin and Haifa for 400,000 francs (a sum equivalent to 2 million US dollars). Two years later, the land was sold to a private investor, Yitzhak Shlezinger, the Odessa Committee and the First London Ahuza society. This land became the core of Karkur, Moshav Gan Hashomron and Kibbutz Ein Shemer. Until actual settlement began, the area was guarded by Hashomer, which planted eucalyptus trees to circumvent a Turkish law that allowed the Ottomans to expropriate lands if they were not cultivated for three years. The early settlements did not fare well. Shlezinger went bankrupt and sold his land to the Jewish National Fund. The London Ahuza society hoped to settle English Jews on the land, but succeeded only partially. Eventually the Jewish National Fund and the London Ahuza society joined forces to establish Karkur. According to a census conducted in 1922 by the British Mandate authorities, Karkur had a population of 38 inhabitants, consisting of 35 Jews and 3 Muslims. Pardes Hanna (lit. "Hanna's orchard", also "Pardes Chana") was founded in 1929 by Palestine Jewish Colonisation Association and named after Hannah Rothschild, daughter of Nathan Mayer Rothschild. On 6 April 1948, the Irgun raided the British Army camp at Pardes Hanna, killing seven British soldiers and stealing a large quantity of weapons. After Israeli independence, Neve Efraim was founded by Jewish immigrants from Yemen and Neve Oved was established by the Labor movement. In addition, many Jews from Mumbai, India, including Jews from Bahrain who fled to Israel via Mumbai, settled there. In the 1950s, the villages Tel Shalom and Neve Efraim were merged with Pardes Hanna. Pardes Hanna and Karkur merged in 1969. According to the Israel Central Bureau of Statistics, the population of Pardes Hanna-Karkur was 41,142 at end of 2017. The land area is 22,596 dunams (~22.6 km²). 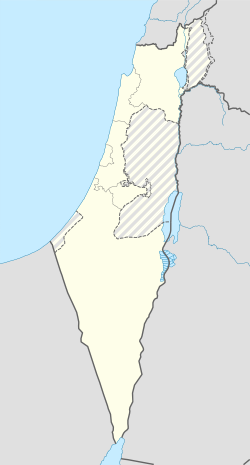 Pardes-Hanna is governed by the largest local council in Israel by population size (among towns without municipal status). The oldest and largest school in Pardes Hanna-Karkur is the Pardes Hanna Agricultural High School. It was established in 1934 by the Association of Farmers and was the first agricultural school to include a full academic matriculation program as part of its curriculum. Pardes Hanna-Karkur has six non-religious elementary schools, including a Democratic school, and four religious elementary schools, as well as the Rimon Waldorf School. A religious high-school for boys, Midrashiat Noam, was once considered the flagship of religious-Zionist education. Its graduates include former ministers Yitzhak Peretz, Benny Elon and Ya'akov Ne'eman; journalists Haim Zisowitz, Yair Sheleg and Adam Baruch; and Labor Party Secretary-General Eitan Cabel. A religious high school for girls, Elisheva, is also located in Pardes Hanna. Pardes Hanna-Karkur is served by the Caesarea-Pardes Hanna Railway Station and by buses run by Egged and Kavim. It is connected to Highway 4 by Road 651, to Highway 65 by Roads 650 and 652, and to Highway 70 by road 652. Yona & Nina Tokayer A.K.A. Yonina, Famous musical couple. Wikimedia Commons has media related to Pardes Hanna-Karkur. ^ a b "Localities File" (XLS). Israel Central Bureau of Statistics. 2017. Retrieved 22 April 2019. This page was last edited on 21 April 2019, at 18:33 (UTC).